Tech-driven change is accelerating. It increasingly disrupts every industry, business, product, and profession. It is no longer possible to project yesterday’s trends to lead markets tomorrow. For example, the perception of some of Silicon Valley’s tech giants is turning negative. They are criticized for managing people with algorithms, growing by replacing the economy’s jobs with AI and automation, and using surveillance business models that manipulate everyone personally. Tech’s anti-people bias is increasingly discussed everywhere. When tech’s growth diminishes our individual futures, people wonder how long their jobs and careers will last, and what the future of their children will be. People come first, and their lives and businesses are advanced everywhere. This new roadmap and technology builds a people-first publishing and media industry. Everyone’s future is raised by increasing their abilities and personal successes. This shifts the mind-set of both tech’s users and its developers. A people-first, exponential growth economy could help millions reach higher potentials and contribute much more to their communities and the world. 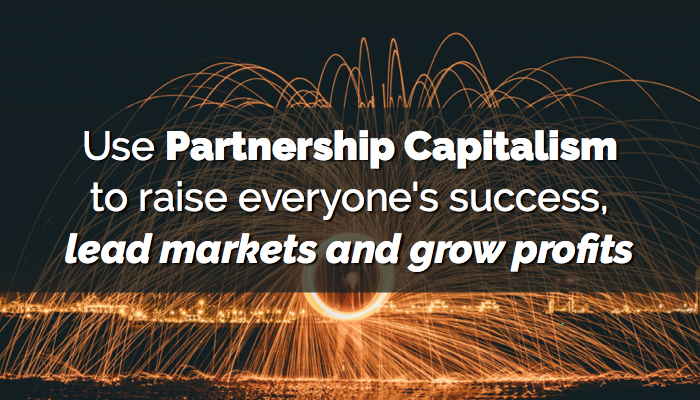 Its name is Partnership Capitalism. This adds a visionary tech-based business model: People-first publishing multiplies markets and profits by helping everyone succeed. It’s contribution is to start universal prosperity, personal protection and greatness for all. What happens to business when users gain control, connected consumption replaces targeted advertising, and supply chains serve users personally? The world’s leading companies and the quality of people’s lives are transformed without revolutions and without attacking those at the top. 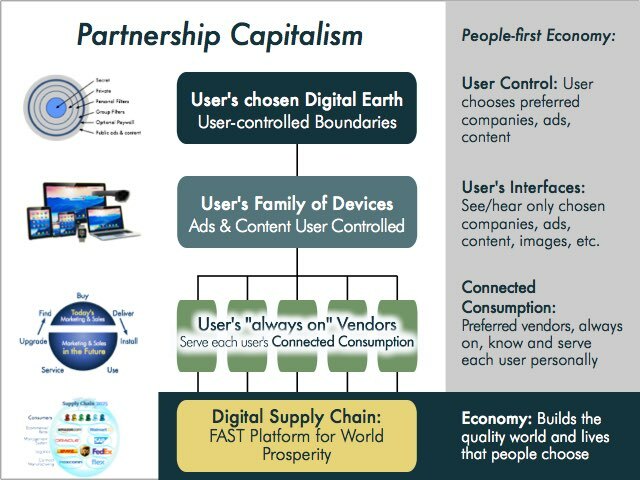 At the top left, users gain control through Digital Boundaries: Consumers choose the vendors, ads and content they want to see. This changes today’s customer-centered marketing into customer-control over which companies are present in their interfaces. At the 2nd level, the user’s family of devices displays only the kinds of choices that are wanted. If a company wants to appear on a users screens, they will sell what that consumer wants to buy — or else they will be invisible. The third level down is Connected Consumption. Each user is continuously connected with their preferred vendors. Consumers receive what they want, where and when they want it. At the bottom, these people-first vendors manage connected supply chains that are driven directly by Connected Consumption. These companies are more efficient and accurate in delivering what connected consumers want all over the world. Publishers and media companies can keep these powerful competitive advantages for themselves. Alternatively, they can partner with strong tech providers that want to help take the lead, so they can rise to the top of a user-controlled Digital Economy. Knowing, searching, shopping, and consuming will be embedded everywhere, no longer separate activities. Exponential Growth Publishers that deliver this will grow ubiquitous and strong, the bringers of platform declines instead of their victims. Publishers’ exponential growth publishing could start a new “alternate reality” mantra for everyone who is stuck: If you don’t like your reality, change it. Starting with, of course, their own reality.